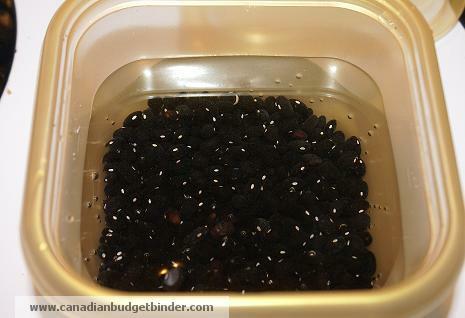 As you know I’m dedicating this week at Canadian Budget Binder to The Welfare Food Challenge. 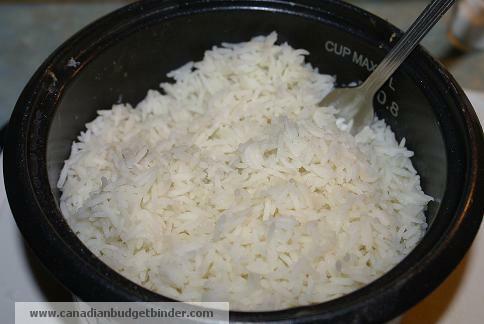 This week I will be Blogging about the steps I had to take to purchase food for a week on a budget of $26 dollars for one person. When Raise The Rates launched this challenge I thought this was a great opportunity to understand a bit of what those on social assistance have to go through when it comes to nutrition and the budget. 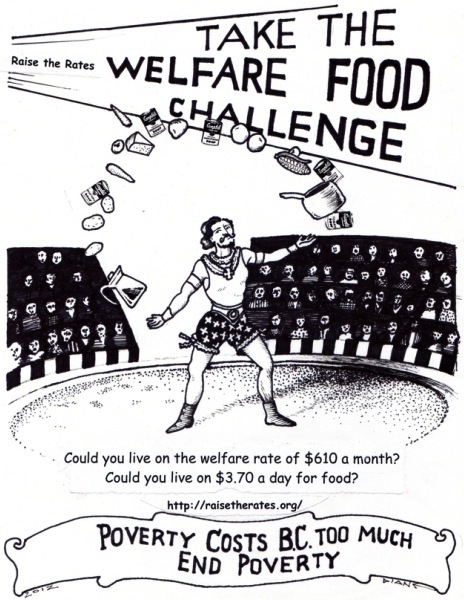 This challenge is to experience what it’s like to live on a grocery budget of $26 a week that of an able-bodied person who receives welfare. This challenge has motivated over 100 people to come forward wanting to participate and has gained wide media coverage. Social Assistance in BC also known as Welfare allows approved recipients $610 a month to live on. Although I don’t live in BC what I do know is that many people right here in Ontario are in need of temporary assistance and apply for Ontario Works each year. A similar challenge called the “Do the Math“ challenge took place in Ontario back in 2010. I know a couple of my fans on Facebook page were asking where the money was going to come from for laundry and personal hygiene yesterday. I was under the impression there was nothing budgeted in the $610 until I read the media release for the Welfare Food Challenge dated Oct 16,2012. In the release there is a chart with a breakdown of where a welfare recipient would potentially spend their money each month in British Columbia. The BC government provides $610 a month in welfare to an able-bodied single person who has to prove they are looking for work. Yesterday I posted The Grocery Game Challenge where you were able to see my Grocery Shopping List for the Welfare Food Challenge. Today I share with you pictures and a recipe for the menu I created of what I ate yesterday along with my thoughts. My recipes changed from the original menu plan and post yesterday but not by much. Everything can change once you start cooking but for me it was mostly flavour changes and I went from a lettuce salad to the carrot salad with beet. 2 x Mr.CBB’s Black Bean Basa Fish Burgers topped with homemade Mayonnaise. I actually made 5 burgers and put them in the freezer 2 for tonight’s dinner and 1 left for a lunch on Thursday. 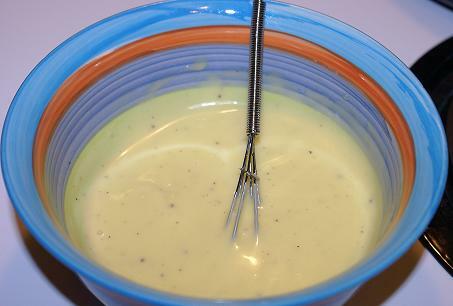 The mayonnaise was a simple 1 egg yolk, squeeze of lemon,salt, pepper, 3 tablespoons extra virgin olive oil, then stir vigorously until thickened then refrigerate. The extra egg white I then added to my egg which I used in my Black Bean Basa Burgers. 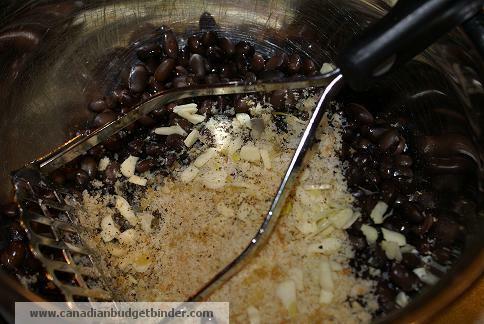 The night before I left out 2 pieces of bread so they could dry out then I pulsed them in the food processor (you could easily put them in a bag and mash them about if you didn’t have one) to make bread crumbs. Sit them on a dish and chill in the freezer for 30 minutes (note: I did use wax paper which now that I think of it I wouldn’t have had unless I used the lining of the cereal bag in my cereal box which would double over for wax paper if you have none) So that was an oops. Fry the patties (I made 2) in 2 tablespoons of extra virgin olive oil until browned and golden on each side. Sit the Black Bean Basa Burgers on top of your Fried Rice then top your burgers with your homemade mayonnaise or mix it into your rice for more flavour like I did. I was quite impressed with this meal and honestly I was so full I likely could have done with 1 burger and less rice. I think I was so hungry from not eating enough during the day that my eyes were bigger than my stomach. Typically I eat about 6 small meals per day so this has thrown my body out of rhythm. The beets were perfect and sweet and I’m glad I picked up that 5 lb bag for $1.00 (wow). It was the first time I had used beets so I will look for other recipes like a chilled beet soup (cold borscht) recommended by one of my fans. The carrot salad was not something I set out to make but I thought I had so many carrots why not and essentially I only anticipated making salad from my iceberg lettuce so this was a great switch up. After dinner I enjoyed a cup of hot black tea with milk. 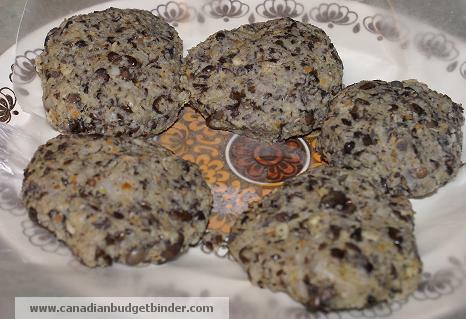 So there you have yesterday’s meal and likely today (Wednesday Oct 17 Th) I will finish up the rice and Black Bean Burgers topped with mayonnaise. 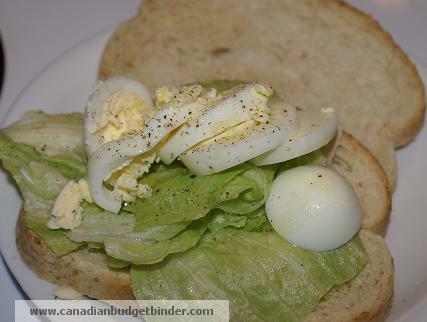 I will also have an egg sandwich for lunch topped with some mayonnaise for flavour as the first one was ok drizzled with olive oil but not the same as with the mayonnaise. I’m from the UK and we use salad cream alot and I love mayonnaise. I will prepare a garden salad with onion, grated carrot,garlic, lime, extra virgin olive oil,salt and pepper and a beet. So although I was very hungry during the day and full at dinner I made to think of a plan to get more food in during the day as it’s simply not enough fuel for my day as a growing active adult male. I’m hoping I don’t run out of food. What did you think of these meals? What are your suggestions for me to get more food during the day? What other meals can you come up with after reading my grocery shopping list? $26 a week is just not possible considering the dietary restrictions and caloric demands of my household. I spent 10 years of my life on a bicycle doing 600km a week or more. Even if I’m sedentary, my base caloric burn is about 4000+. The point of the experiment was to show the government that $26 a week was too little for a single person to live on. Although I made it work it still would have taken me time to build up a pantry of items so I could continue to buy what I needed in bulk. 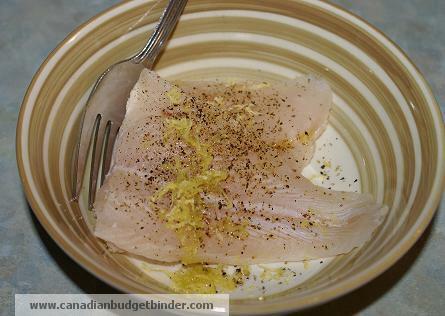 You are right, dietary restrictions for many make the grocery budget an even bigger expenses. Thanks for dropping by mate. My brother lives in Ontario and is on social assistance as he finishes up his highschool he is 20.He is given 1000 a month.$739 of that goes to rent so that leaves him with $261 throw in phone and internet and he is left with about $100 to feed 2 people and his dog..i help out as much as i can but i am in college myself but i send him alot of shampoo,razors,soap i dont live in the same provence as him but trying to teach him how to coupon. It’s not easy but once he gets his high school diploma many doors will open up for him. I’d love to hear his story and how he survives on the income he has if he is interested to share? Anonymous of course. 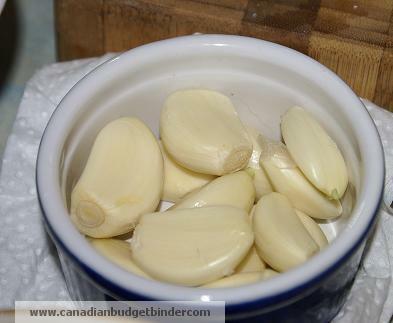 You can buy a little jar of mayo from a place like Shoppers or No Frills for $2. That’s why we do on our $100 per person per month budget. You can also make your own mayo pretty easily – just be sure to use it up quickly. Being hungry is normal 🙂 We get too used to eating until we’re stuffed and staying full all day. If you get hungry an hour or two before a meal time, that’s perfectly normal. If it bothers you, I suggest buying some nuts and dried fruit in bulk and having a handful when your stomach rumbles. I also think you need to make sure you have a better breakfast. You did not have any protein in the morning – no wonder you’re hungry. All you have is starch. Protein is slow to digest, so you’ll feel full longer. That’s why it’s important to have it in the morning. Maybe consider having peanut butter with your toast (again, pretty cheap via sales at shoppers or no-name brands at No Frills/Superstore) or a boiled egg or a slice of meat and cheese. The only part of the Welfare Challenge that I would change is buying oatmeal for breakfast. The $26 doesn’t go far hence no Peanut Butter, lunch meat, mayo ( I made my own). When you are faced with potentially having not enough food at the end of the week you buy products that can go further like beans and rice etc. I would have loved to get fruit but that would not have held me over like a full bowl of rice and beans. This challenge has opened my eyes which I will share but if they gave me the full $109 that a welfare recipient would have to spend on food I could make it stretch for sure, much better than the $26. Kudos to you for being able to do this. There is no way we can do this with our grocery budget being 700 a month for a family of four (includes everything from laundry detergent to food). I’m hoping to get that number down more once our little one grows up a little more. I’m not sure if I have any suggestions because I’ve never even come close to doing something like this. I can say though, one of my cheapest and longest lasting meals that I make is vegetarian minestrone soup. 2 carrots, onion, celery, zucchini (optional I suppose), 1 can of peeled and crushed tomatoes, spaghetti, and beans. Will probably cost more upfront, but it lasts a long time. Or you can freeze it. Good luck on your challenge. I feel grateful I have somewhat of the luxury to eat things that I choose and not worry too much about the cost. Wow, Mr CBB – do you cook like this every day? if so, I’m impressed! Yes we cook everyday like this as we enjoy creating new recipes. The more we come up with exciting food in the kitchen the less we want to spend on eating out which is almost nil unless we splurge on a pizza for $7.00 at the local shop once a month which is rare. Not bad so far… will see how the week goes. I think your meals look delightful. It wouldn’t feed a family of seven but then even with just government assistance a child tax credit would allow to cover the extra bodies. I am going to post my grocery shop this week. Went over my yearly spending of groceries and see that out of the 10 months so far this year I am over ( not by much) all but four months. 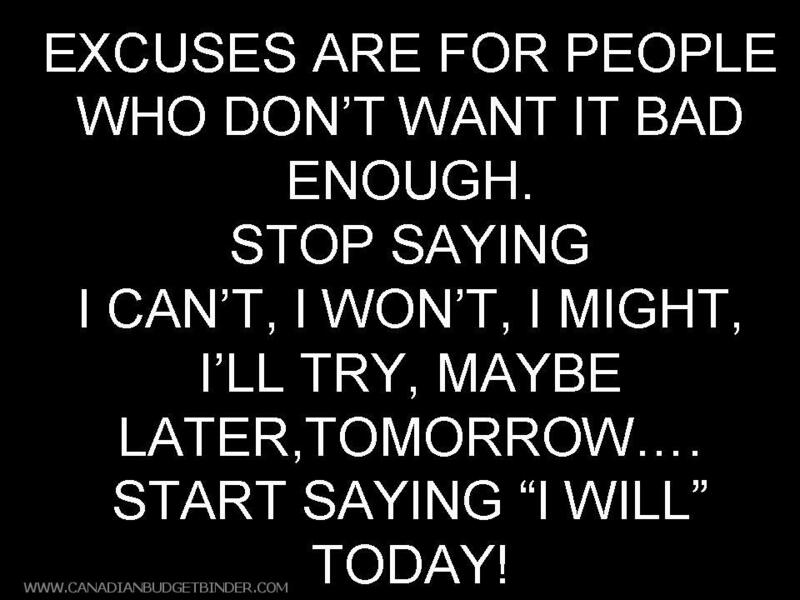 This challenge will keep me focused on my spending habits. Looks like you are having some creative fun with your recipes. Wish to see some fruit though. A suggestion to anyone, expectationally if you live in a small town area. Ask your grocer what they do with the fruits and vegetables that they remove from the shelves? Tell them you have chickens or are interest in purchasing or having ( free) a lump lot (box) of these. You will be amazed at what you can get for free! A lot of this gets picked up by pig farmers, but just because an apple doesn’t look good, doesn’t mean it isn’t perfect for an apple cake, pie, fritters, or slices for that toddler. Just ask, see what happens. I love what you are doing! I think we close our minds off to think what it might be like to have to live like this.It really makes us aware of the poor among us and what they deal with. By the way I love your blog.. I like Aunt B’s suggestion of oatmeal, might stick to the ribs more than cold cereal….. The burgers look good, glad they were filling. Left-overs are a great help to stretch meals….we have them all the time!!! Sorry, can’t come up with any meals with your grocery list since I don’t eat a lot of that stuff lol but I probably would have gone with oatmeal for breakfast as it is very filling. It is the only thing that can get me to lunch time without snacking 🙂 You’re doing great! Keep it up! Hi Mr. CBB. I understand the hungry by lunch, hungry by dinner thing so here are a couple of suggestions for future reference. 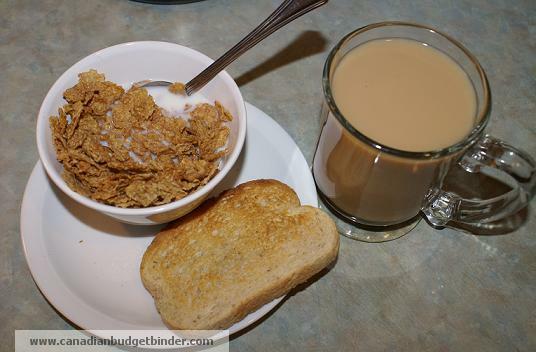 Hot cereal like oatmeal or Red River are made with whole grains. In combination with milk, they provide a complete protein (all 22 amino acids) so they may stick with you a little longer than the bran flakes would. They’re likely a little less expensive too. 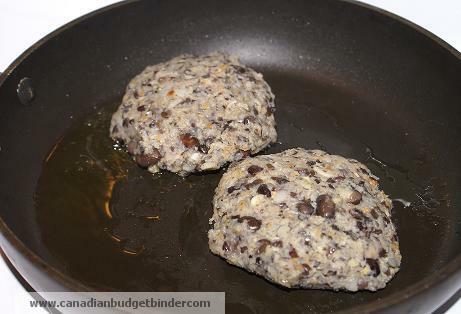 The meal looks great, even though I have to admit I am not a black bean burger fan. I can imagine you were hungry do to the change in your meal habits, it sounds like quite the change. Honestly the burger surprised me, I loved it. I’m eating it again tonight I loved it that much. 😉 I’m trying to eat what I cook before I make more food. 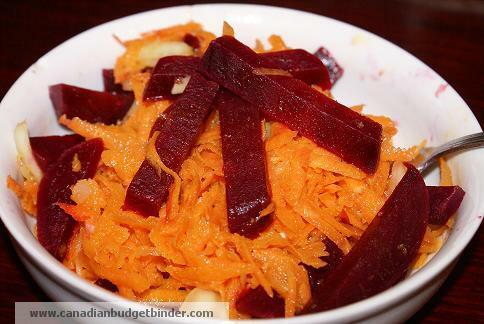 The carrot and beet salad was pretty awesome too. Alot of it is attributed to flavouring and to me that’s important above all. I’d rather eat beans and rice with garlic, lemon and olive oil all week then no flavours at all. Never know what’s going to come out of my kitchen and yes I’ve been very very hungry as I eat more than this throughout the day. Cheers John.